…of OCW benefits, I thought I’d share an internal resource from the OCW communication locker, our compilation of case study slides. This is not a presentation, but rather a set of cases studies designed to be used to tailor use cases in our other presentations for specific audiences. Each is a set of three slides, the full case for the speaker’s benefit study plus two slides intended to be actually used in the presentation. There’s also a cross-index at the front that sorts the external case studies by region and scenario of use. I think the variety of benefits illustrated here demonstrates the complexity of talking about OCW benefits in the abstract, or event at the level of data such as that presented in my previous post. Anyway, also provided in the interest of getting more data out there to support informed discussion. For those interested in communication best practices, the two presentation slides incorporate our basic “nugget” of mini-case study information: A basic statement of the use or (preferably) the benefit, followed by an illustrative quote. These nuggets are easy and low-effort to collect from our user feedback and surveys, and can be deployed in a number of ways (we have a standard e-mail reply that asks permission to use a quote and for a photograph). The statements make nice one-liners in speeches (“from the teacher in Argentina who…to the student in China that…to the homeschooling parent in the US who…”). The quotes are also great in a wide variety of contexts, including slides as included here. The full case studies are harder to come by, requiring a follow-up interview and some dedicated writing time, but they are well worth the effort. The OpenCourseWare Consortium is pleased to announce the call for nominations for the inaugural Awards for OpenCourseWare Excellence (ACE). The first OCW ACEs will be presented at the next global OpenCourseWare Consortium meeting in Cambridge, MA, USA, on the MIT campus May 4-6, 2011. The Awards for OpenCourseWare excellence will recognize outstanding individual contributions to the OCW/OER movement, exemplary OCW member sites and excellent individual course presentations. ACE site and course winners will be selected by the award committee, and individual winners will be selected by a vote of the board of directors. Nominations for individuals, sites and courses will be accepted through January 15, 2011 and may be submitted through the following page (http://ocwconsortium.org/ace) or by e-mailing ace@ocwconsortium.org. Nominations for sites and courses are encouraged to be submitted as two-minute video/screen capture tours of the relevant content. Visit the above web page for complete information on preliminary criteria, rules and eligibility. The OCWC is seeking volunteers to serve on the initial ACE Committee to refine award criteria and select award finalists. The Consortium is also seeking a sponsor for the awards ceremony at the upcoming Consortium meeting. For more information, please contact Stephen Carson: scarson at ocwconsortium dot org. In his junior year at Klein Oak High School in Spring, Texas, Mat Peterson — now an MIT freshman — was struggling with his physics course. A friend of his recommended that he look at MIT OpenCourseWare, where Peterson turned to Walter Lewin’s videos and found the help he needed. We encourage submissions for sessions that highlight the impact of OpenCourseWare, summarize research, showcase best practices, discuss issues facing the community, and encourage thinking about the future of “open” learning. In keeping with the theme of the conference, we particularly welcome proposals that integrate accounts of OpenCourseWare’s evolution with next steps for the movement. How is OCW being used? Who is using it? For what are they using it? What do analytics and evaluation say about OCW use? What are innovative forms of OCW use? How might we better promote these new forms? How does OCW, or open educational resources, integrate with traditional education systems? What have we learned from a decade of publishing OCWs? What might we do differently with OCW production? What have we learned about user interfaces and content navigation? How might we improve the user experience? How do we increase usability of OCW? How have OCWs used content management to support their publishing process? What are the on-going challenges, and possible solutions, to continued production of OCWs? How does OCW integrate into the ever-expanding landscape of “open” learning? 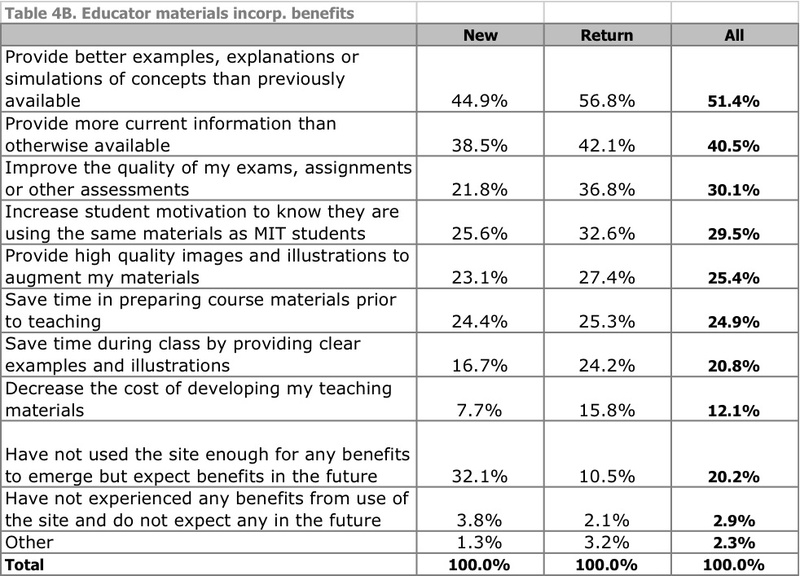 How do open textbooks and open educational resources impact OCW? What are the impacts on institutional planning and administrative challenges with sustaining OCW? What are the impacts on and potential for next generation OCW management systems? How does OCW fit into Education 2.0? How are OCWs transforming and evolving to support Education 2.0? Presentation: Presentations are traditional sessions by one or more authors that are designed to provide an in-depth examination of topic(s) of interest. Presentation proposals should include the intended audience and expected outcomes for the session. Panel: Panels are moderated sessions of experts discussing a topic that are designed to give the audience different perspectives on that topic. Panels can be organized as a series of expert presentations, or as a more interactive roundtable discussion. Panel proposals should include the topics each panelist plans on addressing, intended audience and expected outcomes for the session. Demonstrations/Poster Session: Demonstrations/poster sessions are designed to provide opportunities for informal discussions with colleagues about specific projects, including interactive and hands-on use. Poster/demonstration session should provide information on the project or topic that would be easy to understand in 5-15 minutes. Demonstration/poster session proposals should include the type of session and expected outcomes for the session. Pre-conference Workshop: This year we will have a limited number of pre-conference workshops. Workshops are interactive sessions designed to address issues, tools, or topics of interest to the OpenCourseWare community. They should educate or train participants in a particular area. Examples include workshops on technology, demonstrations of OpenCourseWare tools, or processes for working with intellectual property issues. Workshop session proposals should describe the workshop content, intended audience and expected outcomes for the session. Workshop proposals should also indicate either whether the workshop is intended for 3 or 6 hours. Session proposals will be submitted through the conference website, conference.ocwconsortium.org. Submissions for the OCWC GLobal 2011 conference must include a short description (140 characters) and an extended abstract (500 words) about the proposed session. If your proposal is accepted, you will have the opportunity to submit a full paper that will be published in the conference proceedings. Session proposals will be accepted in either English or Spanish. Proposal submissions in Spanish may also include an optional English translation (those submissions without translations will be translated by OCW Consortium staff for review by the program committee). We encourage proposals for sessions that are original, engaging, significant, clear and relevant.